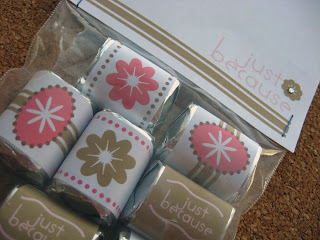 Tomorrow I'll have the bag topper and candy wrapper labels for your downloading pleasure! Ok, download the two PDF's and you're good to go! I wrapped the labels around Hershey's Nuggets so all you'll need is a bag of those and you're ready! The instructions for the bag toppers are in the download and I just added a simple silver rhinestone for something extra. Here's the links! Click to download the PDF's. Let me know if you've got any questions or comments! ooo!! i think i have a little pick me up for my students lined up now. This is great! I've been saving it & I finally printed it off tonight. I'm putting it together for my Secret Sister at church. It's great. Thanks!! !